Eye-Fi has announced a new memory card called Eye-Fi Pro X2 8GB. The Eye-Fi Pro X2 memory card is supposed to be the fastest and largest from the company. The memory card is able to wireless transfer photos and videos to your computer and 25 photo and video sharing sites on the net. Among the sites we find Flickr, Picasa and Facebook. The Eye-Fi Pro X2 will be availble later this year for about $150. INTERNATIONAL CONSUMER ELECTRONICS SHOW, LAS VEGAS, NV — Eye-Fi Inc. has developed the next generation Eye-Fi experience, which includes an entirely new platform and more flexible sharing options. Unveiled today, the 8GB Eye-Fi Pro X2 is powered by Eye-Fi’s proprietary X2 engine and is the company’s revolutionary step in achieving high-end memory card performance. Photo enthusiasts will benefit from increased storage capacity, Class 6 performance for faster read/write speeds, faster-than-ever wireless photo and video uploads and increased Wi-Fi range. Eye-Fi Pro X2 users will also benefit from a new feature, Endless Memory mode, which enables the Eye-Fi card to automatically make space available after photos and videos are uploaded. Last, Eye-Fi is introducing Eye-Fi Center, a new desktop application that gives users more options in sharing their digital memories. The Eye-Fi Pro X2 has been honored this year as a CES Innovations Honoree. More information will be available in Eye-Fi’s CES booth in the Digital Imaging Zone of South Hall Three at the LVCC, #31916. The 8GB SDHC Eye-Fi Pro X2 is powered by Eye-Fi’s proprietary X2 engine which includes an exclusively designed chip and an 802.11n radio. The X2 engine enables greater flexibility in memory capacity and faster read write/speeds, achieving Class 6 performance. The 802.11n radio and a new antenna design enable faster wireless uploads and increased Wi-Fi range, and still support the 802.11b and 802.11g standards. The Eye-Fi Pro X2 wirelessly uploads JPEG and RAW images and videos from the camera to computer and one of 25 online photo and video sharing sites, such as Flickr, Picasa or Facebook. It also allows users to create an ad hoc connection directly to their computer to wirelessly upload photos and videos while away from a wireless router. Or users can upload away from home at more than 10,000 Wayport and open hotspots. Pro X2 automatically geotags photos with information about where the images were taken. It is available for pre-order on http://www.eye.fi and at select online retailers such as Amazon.com for an MSRP of $149.99. In Endless Memory mode users can choose to have Eye-Fi automatically make space available on their Eye-Fi Pro X2. Using the card’s ability to communicate with the Eye-Fi Service, it receives confirmation whenever photos and videos are safely delivered to the user’s computer and/or online sharing site. When the card reaches the user’s pre-determined amount of space used, it will remove files that have been safely uploaded, beginning with the oldest – even when the card is not connected to the network. If files have not yet been uploaded, the Pro X2 will not remove them. This option can be set up in Eye-Fi Center. Eye-Fi also introduced Eye-Fi Center, a new desktop application for managing the Eye-Fi card and experience. Eye-Fi Center has a redesigned interface that is easy to navigate and use, with drag and drop capabilities. Eye-Fi Center allows users to easily select and republish photos and videos to different online locations, so users can share on multiple sites. It also allows users to get any photos or videos on their computer (even those not uploaded with an Eye-Fi card) into the Eye-Fi system, where they can be easily published online. And it allows users to access some features, even when not connected to the Internet, such as adding a wireless network to their card. Eye-Fi Center will be available for download later this month. The Eye-Fi Pro X2 has been named an International CES Innovations 2010 Design and Engineering Award Honoree for the X2 engine’s innovative design qualities. Products entered in this program are judged by a panel of independent industrial designers, engineers and members of the media to honor cutting edge consumer electronics products. It will be on display in the Grand Lobby of the LVCC during the 2010 International CES. Eye-Fi’s current line-up of wireless SD and SDHC memory cards range in price from $49-$149 and are available at http://www.eye.fi, in store at Apple Retail Stores and Best Buy locations, and at major online retailers such as Amazon.com and Walmart.com. Eye-Fi has received numerous product awards including Popular Photography’s 2009 Photography’s Outstanding Products (POP) awards and “Last Gadget Standing” at the 2009 Consumer Electronics Show in Las Vegas for the second year in a row. For more information, please visit http://www.eye.fi or follow us on Twitter @EyeFiCard. Founded in 2005, Eye-Fi is dedicated to building products and services that help consumers manage, nurture and share their visual memories. Eye-Fi’s patent-pending technology wirelessly and automatically uploads photos and videos from digital imaging devices, including digital cameras and the iPhone, to online, in-home and retail destinations. Headquartered in Mountain View, Calif., the company’s investors include LMS Capital, Opus Capital, Shasta Ventures and TransLink Capital. Kodak has announced a new compact digital camera with a large touchscreen. The camera is called Kodak SLICE and also features 14 megapixels and 5x optical zoom. The Kodak SLICE will be available in April 2010 and cost about $350. Rochester, NY, Jan. 6 — Eastman Kodak Company today announced the latest addition to its consumer digital product portfolio, designed to make it easier than ever for people to share pictures with family and friends anytime, anywhere. The KODAK SLICE Touchscreen Camera lets consumers carry a personal photo album worth sharing and reliving at all times. With a sleek and intuitive 3.5-inch touchscreen, and the KODAK SLICE Search Feature, consumers can find the pictures they want from up to 5,000 that can be stored on internal memory. Then, they can easily share those pictures right from the back of the camera. More than 75 million people worldwide manage, share and create photo gifts online at KODAK Gallery — join for free today at www.kodakgallery.com. © Kodak, 2010. KODAK and SLICE are trademarks of Kodak. SCHNEIDER-KREUZNACH is a trademark of Jos. Schneider Optische Werke GmbH used under license by Kodak. 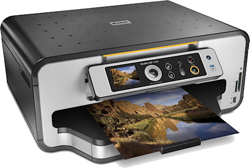 Kodak has announced the Kodak ESP 7250 All-in-One printer. This printer from Kodak is able to print directly from smartphones through WiFi. The printer also has built-in duplexing and memory card slots. The Kodak ESP 7250 printer will be available in April 2010 and cost about $200. Rochester, NY, January 7, 2010 — Eastman Kodak Company (NYSE: EK) invites consumers to unlock the photos and documents stored in their Smartphones1 with its new KODAK ESP 7250 All-in-One (AiO) Printer. Featuring easy-to-use wireless capabilities, an intuitive control panel and the lowest total ink replacement cost in the industry2, the new KODAK ESP 7250 helps you share and print your mobile life for less, saving consumers an average of $110 a year on ink based on as few as four pages per day3. Kodak knows that on-the-go lifestyles need easy solutions, such as the ability to print and share without turning on a computer. The ESP 7250 can print documents and photos directly from Wi-Fi enabled BLACKBERRY Smartphones1, offering the world’s first direct WiFi printing solution for those devices. In addition, users of iPhone and iPod Touch devices can print photos directly to the ESP 7250 through the new Kodak Pic Flick application. The ESP 7250 joins Kodak’s award-winning line of printers that allow consumers to print vivid color documents and KODAK lab-quality photos4 for less, saving on average $110 a year on ink based on as few as four pages per day3. Kodak prints have achieved best-in-class permanence ratings from the leading independent testing laboratory, Wilhelm Imaging Research (WIR). Value does not come with compromises on the ESP 7250. In addition to saving on ink, the ESP 7250 combines the latest in KODACOLOR printing technology with affordable, premium-quality pigment ink cartridges to deliver brilliant documents and KODAK Lab-Quality photos4 that dry instantly, are water and fade resistant5 and last a lifetime6. KODAK AiO Printers use Kodak’s premium pigmented inks that come in a simple two-cartridge set-up. Kodak Black Ink Cartridge 10B cartridges retail for $9.99 U.S. MSRP and a five-ink color cartridge, Kodak Color Ink Cartridge 10C, which offers 10% more pages than the current #10 color cartridge, retails at $17.99 (U.S. MSRP). In addition, Kodak announced a new Kodak Black Ink Cartridge 10XL ($16.99 U.S. MSRP) which provides 70% more pages than the standard Kodak Black Ink Cartridge 10B, providing greater convenience for consumers who print more frequently and want to change their ink cartridges less often. Available in April 2010, the KODAK ESP 7250 retails for $199.99 U.S.MSRP. . Kodak Black Ink Cartridge 10XL and Kodak Color Ink Cartridge10C are available February 2010. Learn more about Kodak’s inkjet portfolio and see how much you’re overpaying for ink at www.printandprosper.com. General Imaging has announced four new compact digital cameras. They are called GE E1486TW, E1480W, A1255 and A1455. 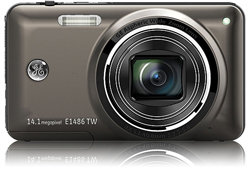 The top models GE E1486TW and E1480W in the Power Series features 14 megapixels, 3″ LCD screen, 8x optical zoom (28-224mm), optical image stabilization and the ability to record HD movies. One major difference between the two cameras is that the E1486TW have a touchscreen. The two cameras will cost about $180 and $150, and will be available on the marked during the spring of 2010. The other two models, A1255 and A1455, is a part of the Smart Series and comes with 5x optical zoom and 2.7″ LCD screen. The GE A1255 will have a 12 megapixel image sensor while the GE 1455 will have a 14 megapixel version. The cameras will cost about $90 and $100, and will come on the marked during the spring of 2010. LAS VEGAS /PRNewswire/—DIGITAL EXPERIENCE AT CES – Whether your New Year’s resolution is to take better pictures or capture more memories, General Imaging, the worldwide exclusive licensee for GE digital cameras, will unveil four new cameras today that make either resolution easy. For focused photographers looking for more power and performance at an affordable price, the GE E1486TW and E1480W are the latest additions to the Power Series. Both the E1486TW and E1480W are loaded with highly-coveted features, including the ability to film high-definition movies, 14-megapixel resolution for incredible clarity, an amazing 8X optical zoom that’s unprecedented at this price point, and a large 3-inch LCD screen. At only .83 inches thick, the cameras offer one of the slimmest 8X optical zoom performance in the market. Both the E1486TW and E1480W offer innovative OIS image stabilization technology that ensures crisp, clear photos every time, while a 28-mm angle glass lens provides the flexibility to go wide when needed. In addition, the E1486TW offers an innovative touch screen control, putting the control at your fingertips. A simple swipe of your finger lets you scroll through recent shots and swipe the screen to zoom photos. The E1486TW and E1480W are attractively priced with suggested retail prices (SRPs) of $179.99 and $149.99, respectively. They will ship this spring, and are available in black, red and silver among other colors. The GE line continues to build upon the legacy of the Smart Series, by introducing two new stylish cameras with intuitive features that make beautiful photography simple, easy to use and at a smart value. The GE A1255 and GE A1455 each offer 5X optical zoom to get you closer to your subjects and a 2.7-inch LCD screen to easily preview your shots. The GE A1255 is a robust camera that features 12 megapixels of resolution, for a SRP of $89.99. For the everyday photographer who seeks even greater high-resolution detail, the GE A1455 offers 14 megapixels of resolution for crystal clear enlargements at an SRP of $99.99. Both cameras will ship this spring, and are available in a variety of colors including black, silver and red. Advanced features are standard in all 2010 GE digital cameras including Pan-Capture Panorama for seamless, wide-angle shots; Auto Scene Detection for sharp, vibrant pictures in virtually any setting; Blink, Smile and Face Detection to showcase the best of the people you’re photographing; Image Stabilization for high quality, sharp images; and In-Camera Red-Eye Removal. Based in Torrance, Calif., General Imaging is the worldwide exclusive licensee for GE branded digital cameras. Unveiling its first cameras in March 2007, General Imaging has set a new precedent for high-quality, feature-rich cameras that offer excellent value. For more information about the Smart Series and Power Series and the entire line of GE brand digital cameras, please visit http://www.ge.com/digitalcameras/US.